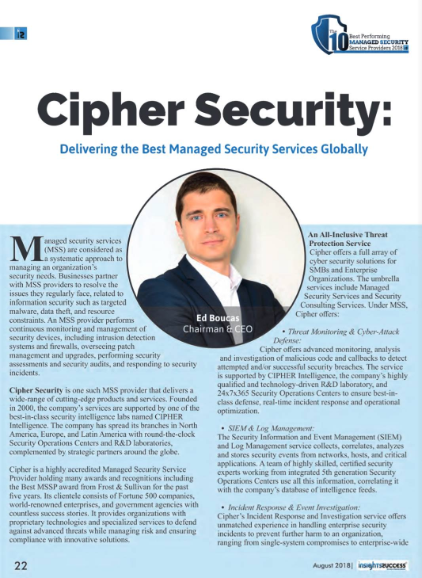 CIPHER is honored to be selected as a Top Managed Security Services Provider (MSSP) by Insights Success Magazine. Determining the best MSSP was the goal in the issue. Editor Bhusam Kadam highlighted the role of MSSPs in “fortifying organizations with security solutions” and observed the growing importance of providers in proving IT security solutions. Read the full article detailing CIPHER’s capabilities online or in digital magazine format. In summary, CIPHER was selected as a top MSSP as a result of it’s complete service offering, 24/7 support and experience. Founded in 2000, CIPHER is a global cybersecurity company that delivers a wide range of Managed Security Services and Security Consulting Services. These offers are supported by the best in class security intelligence lab: CIPHER Intelligence. With offices located in North America, Europe and Latin America, 24×7×365 Security Operations Centers and R&D laboratories, the services are complemented by strategic partners around the globe. CIPHER is a highly accredited company holding ISO 20000 and ISO 27001, SOC I and SOC II, PCI QSA and PCI ASV certifications. We have received many awards including Best MSSP from Frost & Sullivan for the past six years. Our clients consist of Fortune 500 companies, world renowned enterprises and government agencies with countless success stories. CIPHER provides organizations with proprietary technologies and specialized services to defend against advanced threats while managing risk and ensuring compliance through innovative solutions. Insights Success is a business magazine across the globe for enterprises. Being a progress-driven platform, it focuses distinctively on emerging as well as leading companies, their reformative style of conducting business and ways of delivering effective and collaborative solutions to strengthen market share. Here, we talk about leaders’ viewpoints & ideas, latest products/services, etc. Insights Success magazine reaches out to all the ‘C’ Level professional, VPs, Consultants, VCs, Managers, and HRs of various industries.